Sand tray therapy is a form of expressive therapy that is sometimes referred to as sandplay (although sandplay does have a slightly different approach) or the World Technique. It was developed by Margaret Lowenfeld, Goesta Harding, Charlotte Buhler, Hedda Bolgar, Lisolette Fischer, Ruth Bowyer, and Dora Kalff. This type of therapy is often used with children, but can be applied to adults, teens, couples, families, and groups as well. Sand tray therapy allows a person to construct his or her own microcosm using miniature toys and colored sand. The scene created acts as a reflection of the person’s own life and allows him or her the opportunity to resolve conflicts, remove obstacles, and gain acceptance of self. 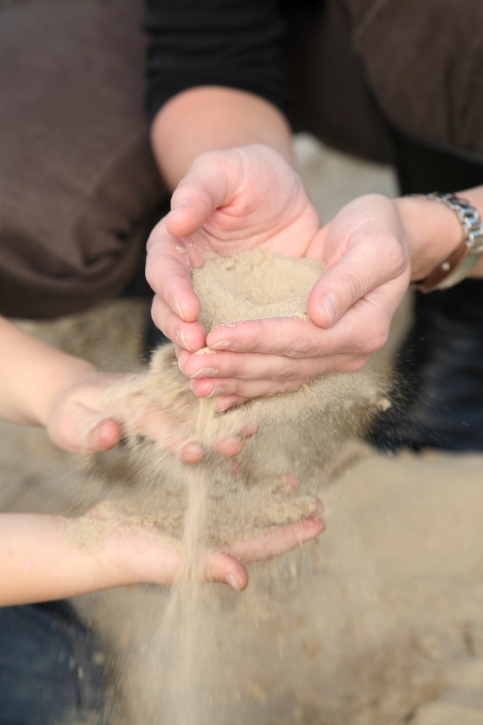 How Do Sand Tray Therapy and Sand Play Therapy Differ? British pediatrician Margaret Lowenfeld is widely regarded as the first person to utilize sand tray as a therapeutic technique. After developing an interest in psychodynamic psychology in 1921, Lowenfeld entered the field of child psychotherapy in 1928. Lowenfeld claimed that her idea of using sand trays in therapy was inspired by the book Floor Games, written in 1911 by H.G. Wells. In the book, Wells describes the various fun-filled games he and his sons played on the floor, and encouraged play as a means of personal development for both children and parents. After establishing the Institute of Child Psychology in London during the early 1930s, Lowenfeld introduced two zinc trays to the children’s playroom; the first was half-filled with sand, the second contained water and a variety of objects used for shaping or molding sand. A “wonder box” filled with small toys, paper, pieces of metal, and other colorful trinkets was kept in close proximity to the trays. Lowenfeld reported that, in time, the children in treatment began referring to the wonder box as the “world,” and that they soon created three dimensional scenes by combining elements from the box with the sand in the tray. She believed that this approach, which she termed the World Technique, could serve as a means of communication between a scene builder and an observer—giving the observer insight into the builder’s inner world. After Dora Kalff was introduced to the World Technique at an international conference in 1956, she came to London to study under Lowenfeld. Kalff eventually combined the Lowenfeld World Technique with Eastern philosophy, Neuman’s system model, and Carl Jung’s theory of individuation. With Lowenfeld’s permission, Kalff termed her approach sandplay, and trained many practitioners around the world in the new technique. How Do Sand Tray Therapy and Sandplay Therapy Differ? Sand tray therapy emphasizes what the person in therapy is experiencing at that moment and therapists are actively involved in facilitating current experiences of awareness and growth. As individuals in treatment are required to open up emotionally—sharing their deepest thoughts and feelings as they happen—the therapeutic relationship in sand tray therapy must be strong in order for the treatment to be effective. In contrast, sandplay therapists focus on the unconscious and seek to provide people in therapy with a free, protected space and the opportunity to communicate non-verbally. As such, sandplay therapists do not interpret, interfere with, or direct the person in therapy in any way and analysis takes place after the therapy session. While verbalization is an essential aspect of each humanistic sand tray session, sandplay therapy may be more effective for children or for individuals who are unable to express themselves verbally due to past trauma. The humanistic approach is a common strategy applied in sand tray therapy. Clinicians who use this technique rely solely on the client to find solutions to their problems, using the sand as a tool for healing. Through creative expression, a person in therapy is able to manifest in sand the things they would otherwise not be able to vocalize or address in traditional therapy. The therapist treats the person as whole and healed, knowing that the process of sand tray therapy allows the person to find the answers that are already within them. One of the most common techniques used in sandplay therapy is the World Technique. This non-verbal approach involves the use of miniatures. People in therapy are encouraged to use miniature toys, figurines, and objects in the sand in ways they choose while the therapist observes and later analyzes the person’s interaction. The person in therapy can add water to the sand and place the miniatures in the sand tray in any order. The design of the sand tray is guided by their imagination and their subconscious. The result is a microcosm of their inner world. The world within the sand tray is expressed through symbolism and metaphor, and may not even make immediate sense to the person creating it. But aided by the therapist, a person in therapy—even a child—can begin to recognize the relationship between the creation in the sand and their own inner world. Many children are unable to verbalize emotional states, particularly in the face of trauma, neglect, or abuse. The non-verbal nature of sandplay therapy and the familiar medium of sand can help children achieve feelings of comfort and security. With little instruction from the therapist, the child is free to play and develop his or her own expression of situations. Oftentimes the children will experience a sense of independent play and will begin making assumptions and behavior changes without cues from the therapist. This method of therapy serves as a valuable and powerful outlet for children and an incredibly insightful method of gaining access to traumatic experiences. Sandplay therapy is also very useful in the treatment of children who have been sexually abused. These children will often remain silent for fear of harm or even death. They are often threatened and are in highly anxious states when they come to therapy. The relaxed and interactive setting of sandplay therapy provides them the initial arena of safety that they need to move toward healing. Although sand tray therapy may look like child’s play, it is a highly therapeutic and multidimensional form of therapy that can provide emotional release and realization for a person in therapy. Adults who have been traumatized and show limited response to other forms of therapy may respond well to sand tray therapy. The environment presents an atmosphere free from threats, and the therapist works with the person in therapy to alter the positions of the miniature objects as representations of the true people and events. By beginning to facilitate change on a fictitious level, a person can gain the courage and ability to recognize that these same changes can be made in his or her own life. While the sandplay process involves creating a series of trays and might last for months or years, significant change may be experienced in just one sand tray session. Sand tray therapists, also called facilitators or witnesses, act as guides for the client or “builder” during the sand tray experience. The witness is taught how to help a builder fully engage in the world they create in the sand. The builder always remains the focus of the process, and the witness is there to encourage, support, and guide the builder as they depict elements of their inner world in the sand. Through training, the witness learns how to integrate additional expressive strategies into the therapy, such as music, narratives, yoga, and meditation. Before a person can claim to be a sandplay therapist, however, he or she must receive certification from the International Society for Sandplay Therapy (ISST). In contrast, a mental health professional can legally advertise himself or herself as a sand tray specialist after undergoing 45 hours of training. To date, sand tray practitioners require no nationally recognized certification. Sand tray therapy, like other therapeutic modalities, can have limitations. Within some communities or cultures, this technique might be viewed as time-consuming, confusing, frustrating, intrusive, or too dependent on the clinical expertise of the therapist. Adults may be resistant to this visually expressive approach because they believe they lack creativity or sufficient artistic skills for the treatment to be effective. Additionally, the interpretation of sand pictures remains a debated topic within the mental health community. At times, the interpretation of symbols, figures, or entire scenes by either the therapist and/or the person in therapy may be vague or ambiguous, with such interpretations sometimes contributing to the neglect of alternative explanations. While the use of sand tray therapy is grounded in theoretical support and considerable clinical evidence, few studies have been conducted to provide concrete scientific validation for the approach.